Even with the largest available memory card, the Vita sets a limit on how many apps can be downloaded. So you shelled out $250 for the PlayStation Vita, and another $100 for a 32GB memory card, the largest size Sony makes. Finally! You can have all the Vita and PSP games, PSOne Originals, apps, and minis you want. Wait, not so fast. According to a NeoGAF poster, the Vita has a set limit on how many apps can be on the system at once, regardless of how much space is on your memory card. As this owner reports it, even with 9GB of space free, an error message appears after downloading application number 101. "There are 101 applications on your PS Vita system. The system can only display up to 100 applications. 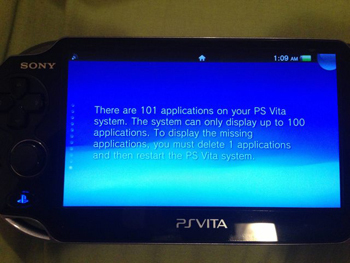 To display the missing applications, you must delete 1 applications and then restart the PS Vita system" was the message that NeoGAF user Shag_187 received; he says that he's downloaded "around 50 minis, 10 PSOne titles, 20 or so mandatory apps, and 20 Vita/PSP games/apps," but still has several gigs of free space on his 32GB memory card. Sony hasn't provided an explanation for the app limit, or even confirmed it, but if it's true it's yet another memory card restriction sure to frustrate Vita owners. We'll update when we know more.